You get free wild flower seeds with this product worth at least £1! Bee friendly is our first children's bee book consisting of coloured pictures by a local Somerset artist, Mia Stanley. Our book is great for children who are just starting to read because of the balance of images and text. We hope it will interest your child with a fun, creative story that they may be able to relate to. 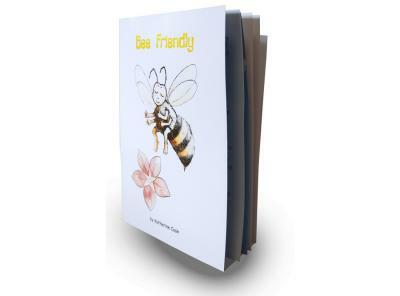 For example our first book is about the adventures that Bee Friendly has on his first day at school. This book will also enhance your child's knowledge as Bee Friendly educates children the importance of preserving the bee population and each book includes some fun and interesting bee facts! Each copy of this Bee Friendly Children's Book will include a free packet of wildflower seeds donated by Chelston Nurseries which you and your child can plant for even more enjoyment with the bonus of this helping to create nectar to preserve the bee population.